.. and encountering certain challenges on the way. The potatoes are producing nice strong greenery this week. There a few tubers each of Rocket and Maris Piper. Rocket lives up to its speedy name by having potatoes ready to eat sooner than other first earlies, but since planting them I’ve learned that their flavour isn’t up to much. Not to worry, some creative cooking will spice them up. Maris Piper is, well, the Maris Piper of maincrops. Said to be the best for making chips, they’re a dream to cook with in any format. Potatoes ready for earthing up: Maris Piper on the left and Rocket on the right. All that foliage needs earthing up of course, so a bag of compost later the leaves had disappeared. I could share a photo of that but it would probably be the dullest photo on the whole internet. The picture below could easily have been that bad – it was nearly a scene of lots of empty pots. These are my precious specialist hot chillies, carefully reared since January. They’d been on a windowsill in recent weeks, waiting for the weather to warm up. When the temperature rose yesterday, I went to move them to the mini greenhouses and was shocked to see dozens of tiny pale fly-like things crawling around on the soil surface in several of the pots. According to my scientific examination, they were the species ‘Bad News’ and needed to be eradicated right away. Many squirts of crawly death spray later, I put them in one of the two greenhouses on their own: a plastic isolation ward so that they didn’t infect anything else. The first checkpoint was today, 24 hours later, and the soil looks quiet and the plants healthy. So fingers crossed they’ll survive. The bugs must have come from eggs in the compost – a bag of Dobbie’s multi-purpose left over from last year – so the rest is getting thrown away. This year I’ve been using Westland and Jack’s Magic, both of which have been very good. 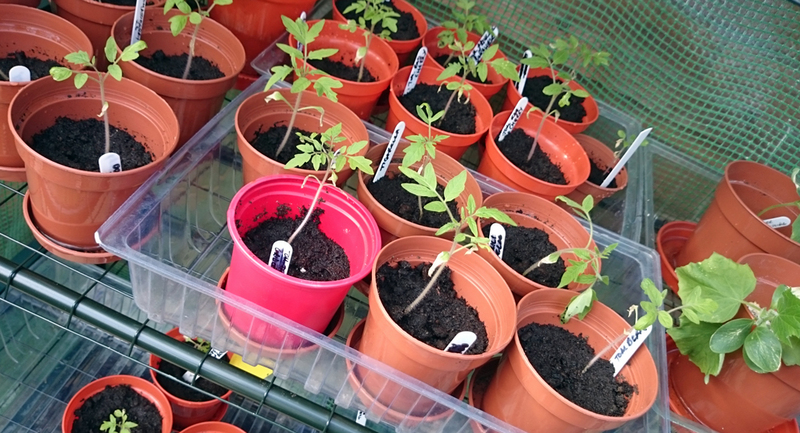 The other greenhouse is open for general admissions and the tomatoes went in this week. At last, some sun! they cried, after weeks of dullness indoors. A careful mix of warmth and ventilation and they should start to take off now. There are some marigolds growing in the propagator, destined to join the toms later and attract lots of pollinating bees. 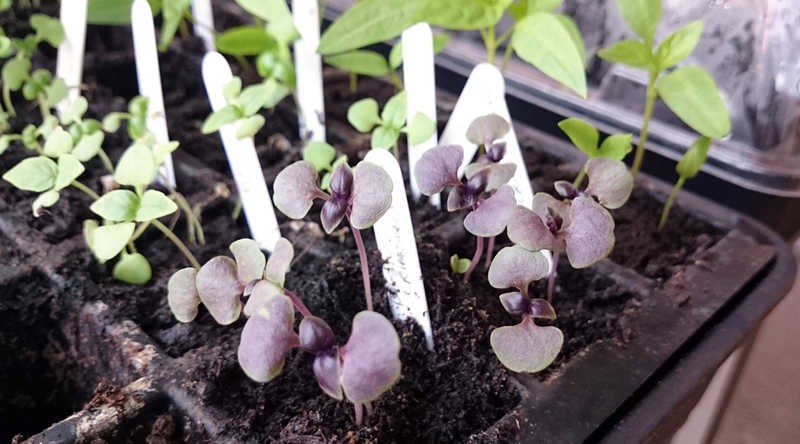 Also in the propagator are several types of basil, my favourite being the purple one; its colour really deepens once it’s growing strongly in the sun. Back out in the beds lots of things were sown today: calabrese/broccoli, perpetual spinach, spring onions, dwarf French beans, lettuces, parsnips (Seed tape, how do I love thee. Let me count the ways) and two courgette plants. Nearby a row of Petrowski turnip seedlings have started to come through. 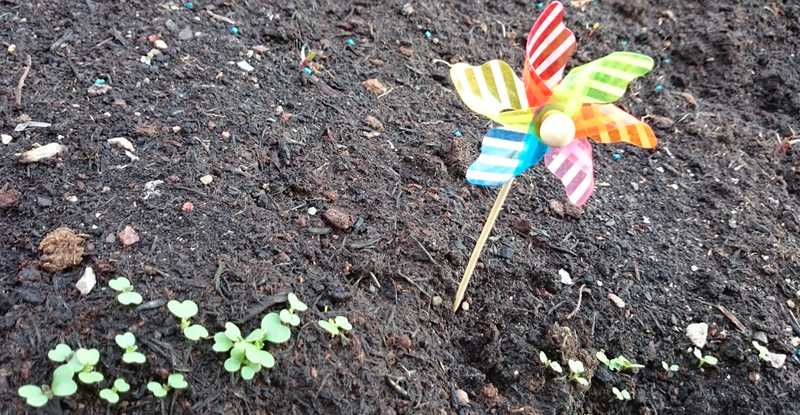 One of them has grown especially strongly and taken the form of a colourful windmill, a bit like one of those that scare pigeons away from ripping your plants up. It’d better work, or else it’ll be pigeon pie for dinner next week. (I wouldn’t, honestly). 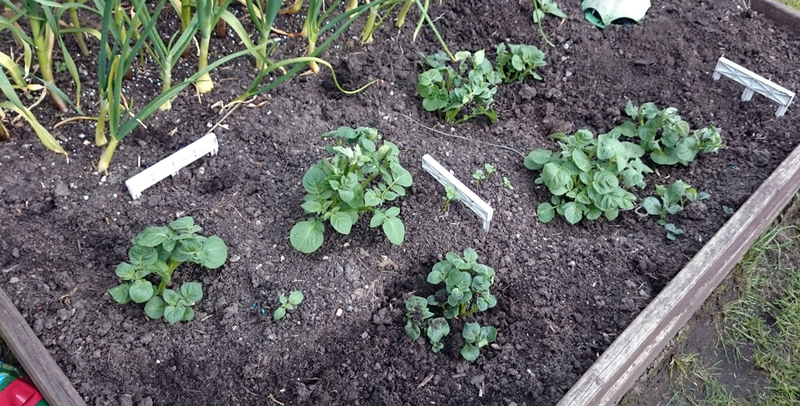 Your spuds are lovely and neat – mine are being disobliging and have come up in a really wiggly configuration. 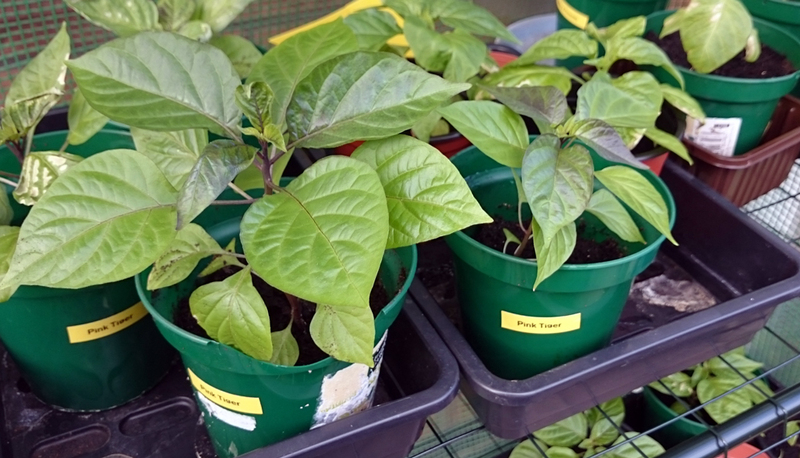 Are your chillies all superhots? Pink Tiger chillies look really lethal – the colours almost pulsate with menace! Yes it’s strange that, because I’m sure I planted them in a wiggly configuration:-) Chillies are all incendiary apart from some jalapenos, which I’m growing just so there’s one I can actually eat! Thanks 🙂 It’s starting to come together, yes. If this nice weather holds all should be well. Your Chillies are looking splendid. Thank you so much! As long as I can keep the bugs at bay I’m hopeful they’ll do well. It doesn’t show too well on the photos above but the top leaves and stems of the Pink Tiger plants are turning dark purple. Which looks pretty pretty!